Educational Qualification: The candidates who are passed in 10+2 with minimum 50% marks in Maths, English and other science subjects from a recognized board in India. Candidates belonging to SC/ST categories need to be only passed in the respective subjects. Age Limit: The candidates should be aged maximum 20 years old on 1 October 2018. Vision Test: The candidates, who are interested in making a career in sea/vessel, will have to pass the prescribed eye test conducted by Mercantile Marine Department. STEP 1: Before filling the online application form, the candidates should read the instruction carefully. STEP 2: Now the candidates can fill the online application form by providing the details required there. The candidates have to fill in the application form their personal details, educational details, address and contact details. The candidates have to save and proceed after filling each step. The candidates should provide each detail in the application form correctly. STEP 3: The candidates have to upload the scanned copy of their latest digital passport size photograph and scanned copy of their signature. The size and pixel of the photograph and signature should be maximum 80KB and 30mm*45mm. STEP 4: The candidates can make payment of the application form through bank demand draft. 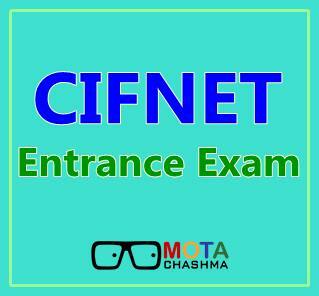 The candidates who will successfully submit the online application form for CIFNET Entrance Exam will be able to download the examination admit card after approval of this in the office. The candidates may also receive their admit card on their email. Candidates are required to bring their admit card at the examination centre. Candidates can download their admit card from the link given below. NRI Category: The NRI candidates can get admission only on the basis of their performance in the interview under NRI quota. If more candidates are applied in this category, the selection will be on the basis of their academic merit and performance in the interview. Marking Scheme: 1 mark will be awarded for each correct answer and 0.25 mark will be deducted for each wrong answer. Syllabus: 11 & 12 level topic in the subjects Maths, Physics, Chemistry, Biology and English language. The candidates can appear in the CET for admission into BFS (NS) program at Central Institute of Fisheries Nautical and Engineering Training (CIFNET) against total 33 seats. These 33 seats are for candidates through CET, NRI and Foreign National as mentioned below. The rule for the reservation is as per the norms of the Government of India i.e. 27%(OBC) 15% (SC)and 7.5%(ST) of the seats are reserved for OBC/SC/ST students respectively. CIFNET Entrance Exam will be conducted on the following centre in India, The timings of the exam would be 10:00 AM to 12:00 PM. The candidates can check the exact centre for the examination on their admit card as well, once the admit card is released.